Keivon Hemming is the Ramapo College of New Jersey 2018 Student Commencement Speaker. Keivon Hemmings is a Music major, double concentrating in Music Production and Music Industry at the Ramapo College of New Jersey. He entered Ramapo College of New Jersey through the Educational Opportunity Fund Program in 2014. Keivon is very involved on campus. He is a third year Resident Assistant, the Student Coordinator of the Ramapo Admissions Student Ambassadors, a Senior Student Aide within the Admissions Office, and a pioneer of the Ramapo College Concert Band. He is also an intern at RCA Records under Sony Music Entertainment in NYC. As an involved student on campus, he can be seen all of the time doing something productive and getting involved. Throughout the years, he has done different things that encapsulates what he represents such as give tours around campus, inform interested candidates about the RA position, and even perform his own music on campus, consequently earning the nickname around campus, “Mr. Ramapo.” Under the stage name Blind Eyez, Keivon has made a name for himself on campus by creating and performing his own music, including opening up for the Spring Concert in his sophomore year in front of over 1,000 people when Kid Ink was the headliner. Approaching the future, Keivon hopes to score a career somewhere in the music industry at Sony or other comparable companies while continuing to work on his own music. 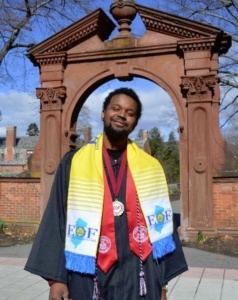 Keivon is the Ramapo College of New Jersey 2018 Student Commencement Speaker.